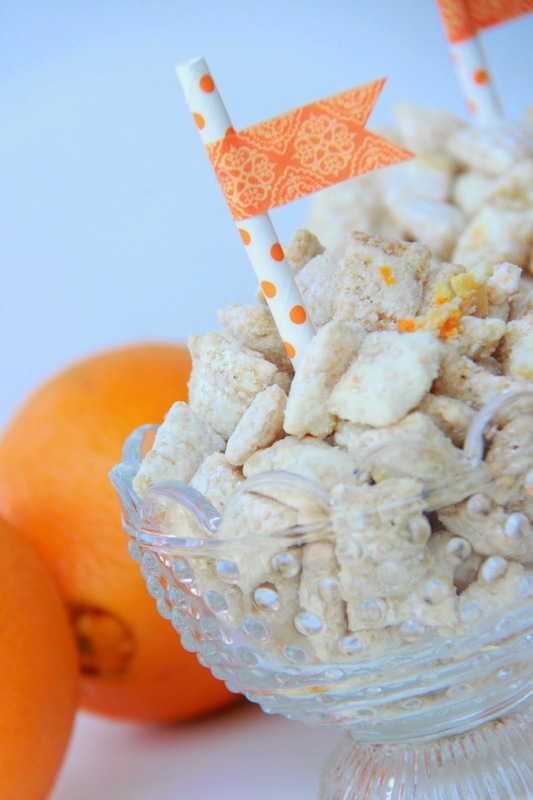 A few Summers ago we made some Lemonade Chex Mix that we were all really fond of. Like 'make a batch and it disappears in an hour' fond of. Well, now we have another Chex Mix concoction to be fond of. 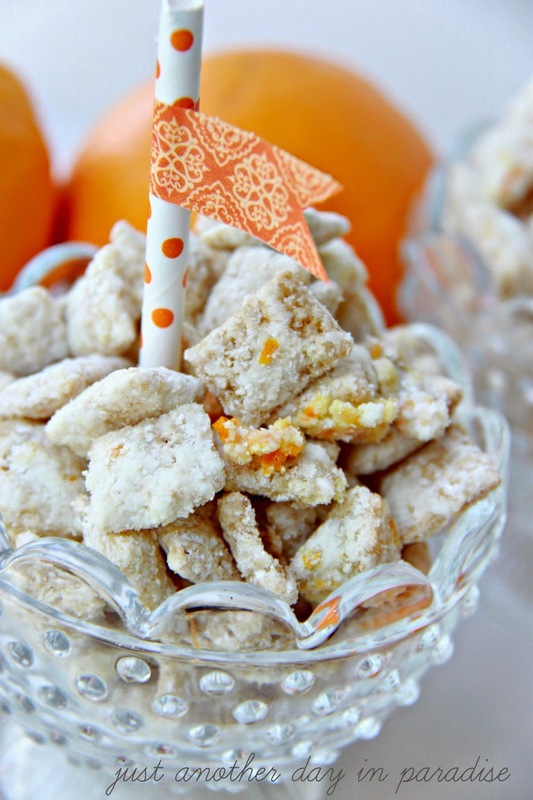 Orange Creamsicle Chex Mix. I have it on pretty good authority that it tastes like Summer. I know, I know, that is two posts in a row that I talk of things tasting like Summer. Between this chex mix and the Vanilla Bean Lemonade from yesterday, we are getting all geared up for Summer. Normally I dread Summer. Summer is not typically my favorite season. Summer is a weird mix of over scheduling and constantly fighting the boredom bug. I am pretty excited for this Summer though. 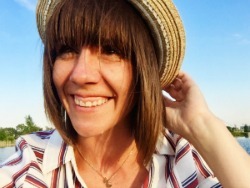 So I have high hopes for a change of heart and a complete enjoyment of Summer. Even though I have traditionally not enjoyed Summer, one thing I love about Summer is all the fresh and crisp flavors. I can tell it is Summer by the overflowing white bowls of fruit setting on my table and counters. I have recently had bowls full of oranges. 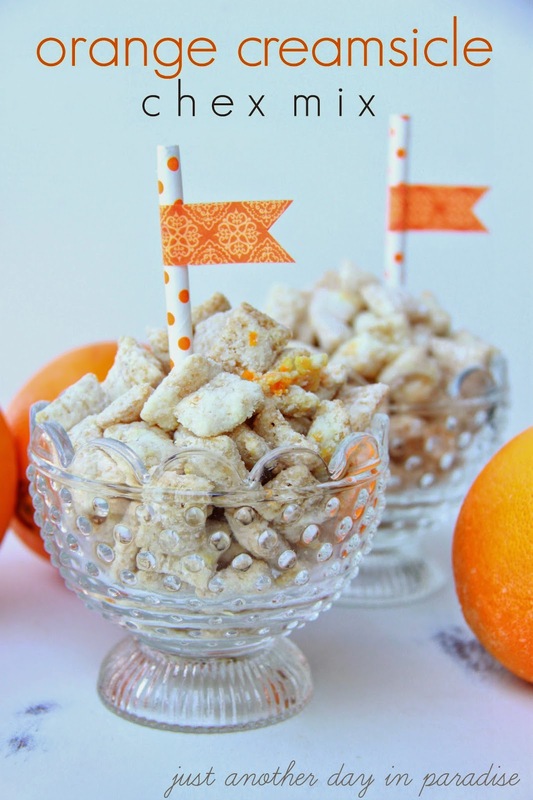 Since orange paired with Summer makes me think of Orange Creamsicle popsicles, it is no surprise my brain immediately made up this Orange Creamsicle Chex Mix. I like to make a batch and then keep some and share the rest. This mix was a HUGE hit. Those with who this little treat was shared loved it and swooned over its yumminess. Okay there was no actual swooning, but they did really like it. I am betting you will too. In a large bowl, pour the cereal. In a microwavable bowl, combine the white chocolate chips, unsalted butter, and 2 teaspoons of orange zest. Heat at 50% for 1 minute. Stir. Repeat for 30 second intervals until the chocolate is melted. Stir in the orange extract. Pour the melted chocolate over the cereal. Carefully stir until the cereal is completely coated. Stir the remaining 2 teaspoons of the orange zest with the 2 cups of powdered sugar. Then pour the powdered sugar over the chocolate covered cereal. Stir to coat. Days are getting warmer and longer. You know what that means don't you? 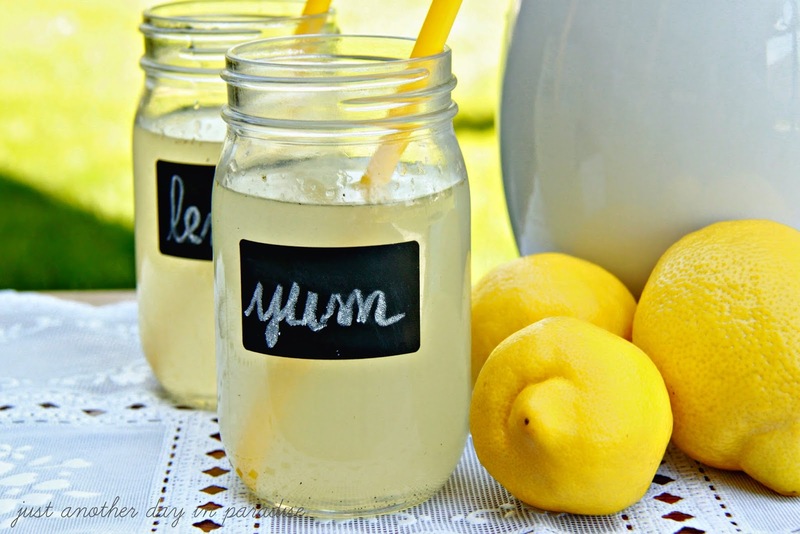 Lots and lots of lemonade. I have two favorite lemonades. Oh gracious. 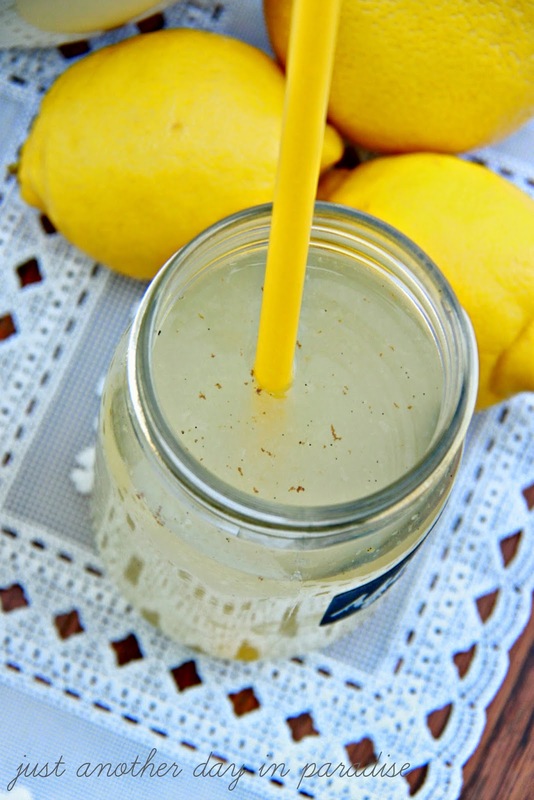 Lemons and vanilla beans. I think they must be soul mates. I am so glad they found each other. 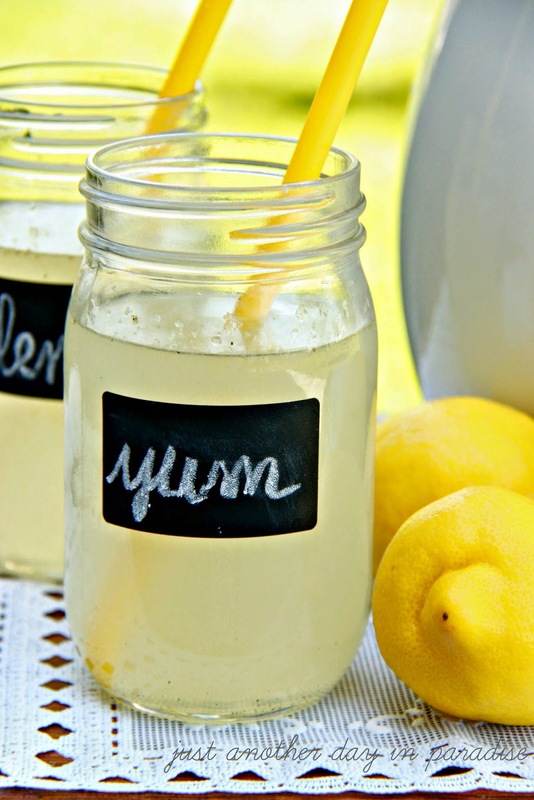 I first had Vanilla Bean Lemonade when we lived in Ohio. The Hubs had come across it at a Market in Cleveland. He bought a few bottles to bring home. After trying some, I had to force myself not to drink it all down. The lemonade was perfectly sweet and tart. Then it finished with the best vanilla flavor. I know it will sound cheesy, but it was like drinking a summer breeze and a summer sunset all in one. We haven't lived in Ohio for almost three years now (which is crazy people, CRAZY) and I haven't had Vanilla Bean Lemonade since then. I have been missing it. I mean, seriously almost three years without my favorite lemonade. Well that is just craziness. So I figured I should probably whip up my own Vanilla Bean Lemonade. Oh my favoritest lemonade I am so glad you are back in my life. 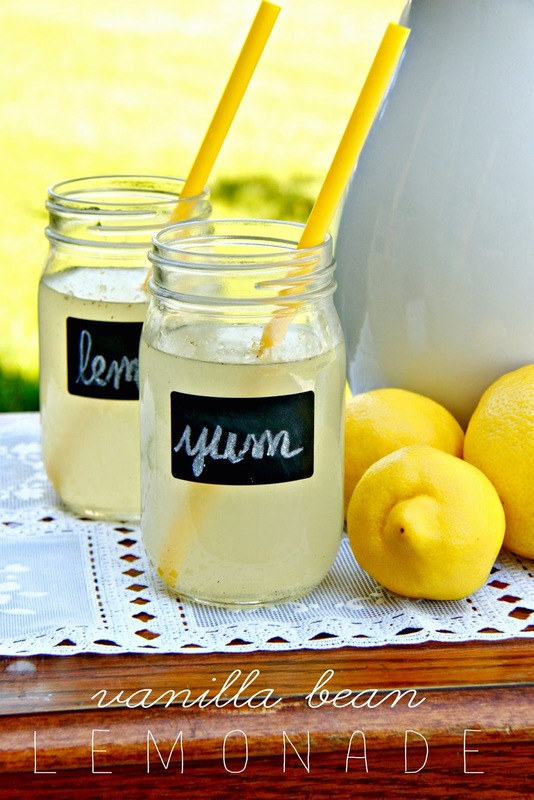 I look forward to many long summer days, relaxing on the back patio with the warm breeze blowing across my bare feet drinking down glassfuls of this lemonade. First, scrap the vanilla bean to get all the seeds out. If you have never scraped a vanilla bean, here is a great video by the Martha Stewart on How to Scrape a Vanilla Bean. Put the sugar into a small bowl and add in the vanilla beans seeds. Mix until the seeds are evenly combined in the sugar. This makes vanilla sugar. Combine the vanilla sugar, lemon juice, water, and vanilla extract in a pitcher. Stir until the sugar is dissolved. Pour into glasses. Add ice. Drink it down. The end of school countdown is on. Oh it's on. On like Donkey Kong. SUMMER BREAK. Time for end of the year treats for the kids to give to a friend or two. 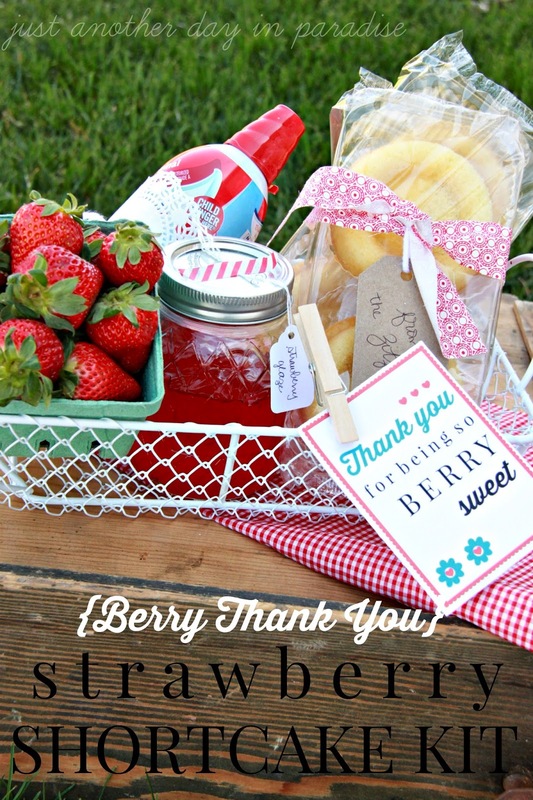 Last year I made up Have a Kool Summer printables to go with Kool-Aid packets. This year's end of the school friend gift idea came when I found these gummy whales. Gummy Whales! I had never seen gummy whales before. 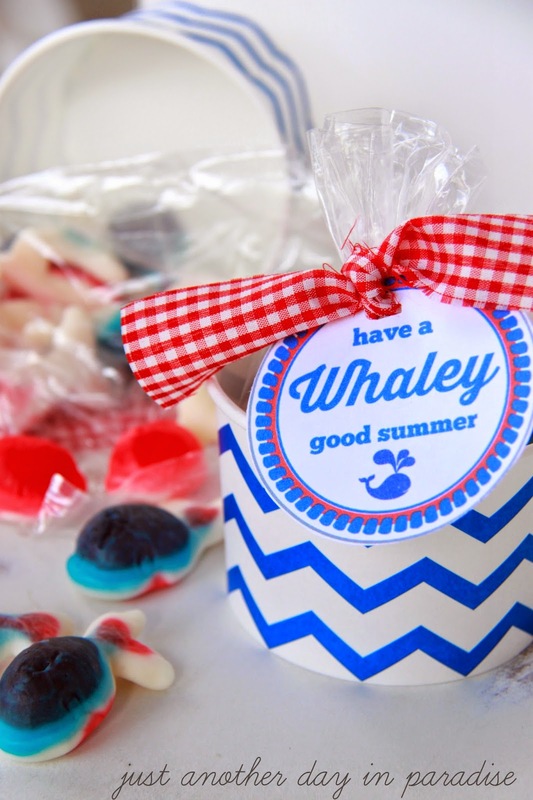 My brain immediately came up with this play on words--Have a Whaley Good Summer. Like seriously, right there in the store. I was standing in front of the bin candy. I stood there staring at the gummy whales running the play on words through my head all while Bean sat patiently in the grocery cart. It is like he is used to this sort of spontaneous grocery store brain storm session. P.S. Does your brain think in play on words? It doesn't. Hmmm. So what you are saying I am not normal. Hehehe, well I knew that. Anyway, so I came up with this idea. I bought myself a bag of gummy whales and then I went home and started putting some together. I designed the tag using PicMonkey. 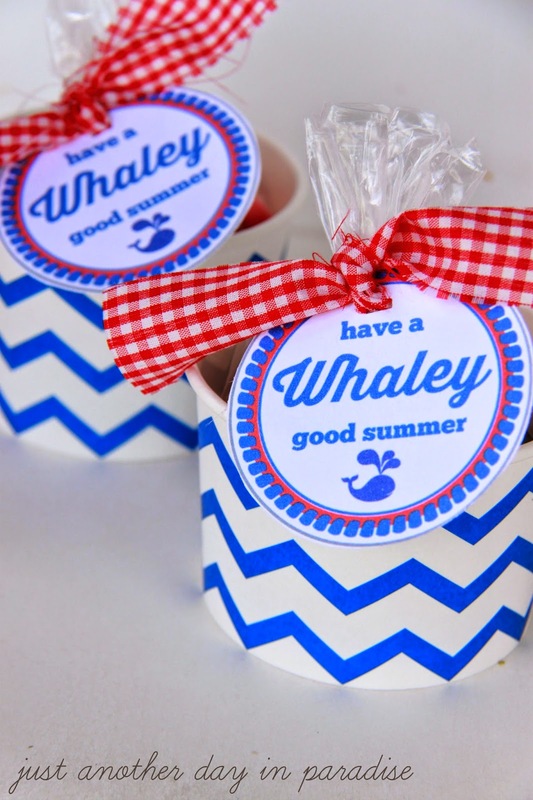 Download the Have a Whaley Good Summer Tags HERE. I put the gummy whales in a treat bag, tied it up with a scrap of fabric. I tied on the tag and then put the treat bag in a fun chevron cup. I love these little cups, they are meant for ice cream, but I think they are great for holding treats. Plus the chevron pattern reminded me of the ocean. Oceans are where whales live. So it really just made sense. 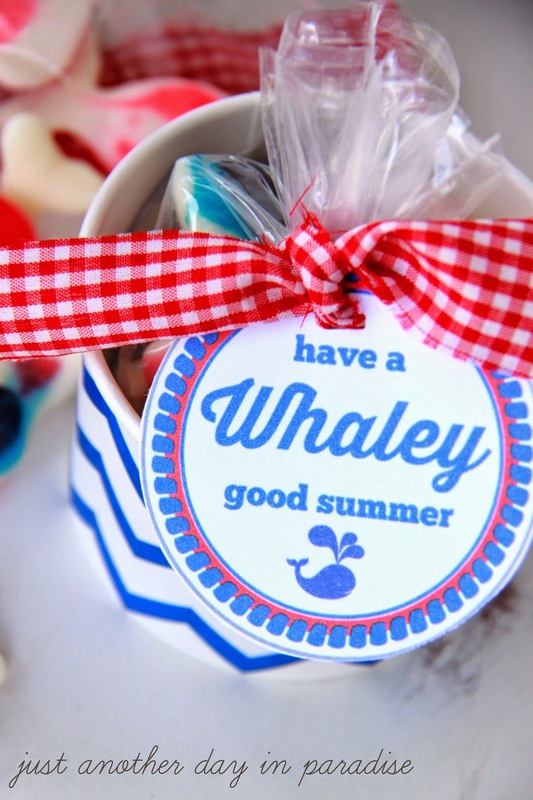 Hope you are excited to have a Whaley good summer! We sure are. Today I am sharing my Top Ten Craft Supplies to buy at WalMart, or as I like to affectionately call it...The Mart. This is a list of things that I buy all the time for projects. Some of these things I pick up practically every time I go. These are items that I use over and over again. I use these things for projects, parties, packaging, presents, and, and, well I am fresh out of "p" words relevant to crafting. The reasons I like buying these things at The Mart are many. First, The Mart is a one stop shop. Oh I need milk? Huh okay, well I will just grab a couple of t-shirts too. Next reason, has got to be the prices. For most of these items, the cheapest you are going to find for them is at The Mart. Another reason I buy these things at The Mart is because for the most part, I know these basics will always be available. 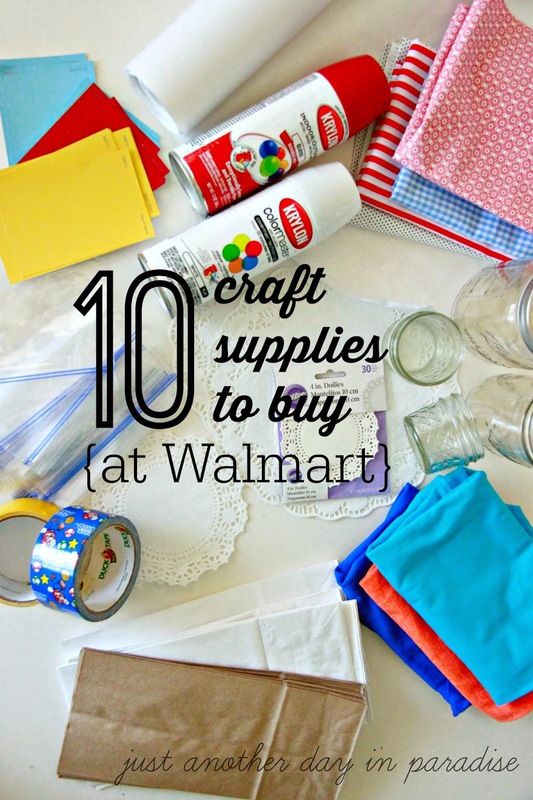 So now that I have blathered on about why I get these Ten Craft Supplies at the Walmart, let's spill about what these ten craft supplies are. 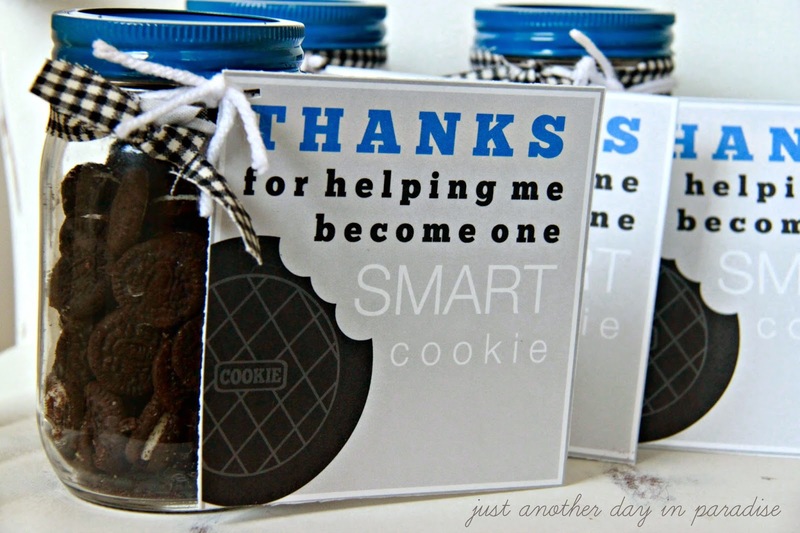 They are great for favors. They can be cut down, sewn together, and stapled closed with a tag. I use sandwich bags for treat packaging. You can buy zip close or fold over. You can get regular, freezer, or snack sized. The packaging possibilities are endless. One of my favorite uses for sandwich bags is with valentines. Like these Dinosaur Valentines. The Mart has a great selection of Duck.tape. We all love Duck tape. 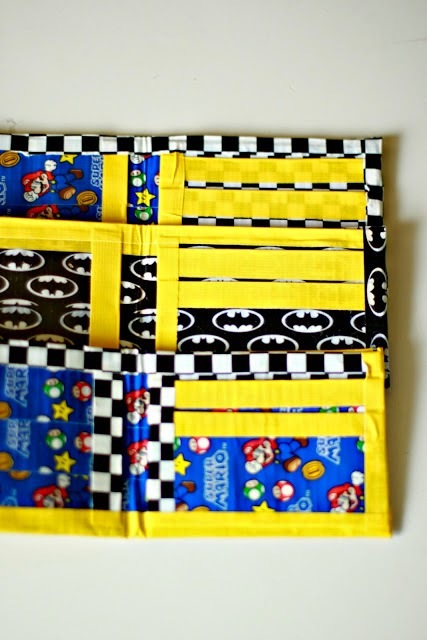 There are so many fun projects to make with Duck Tape. A few of my favorite are Duck Tape Rockets, Duck Tape Wallets, and Indoor Hockey with Duck Tape Hockey Sticks. Oh, freezer paper you versatile beauty you. I have been using freezer paper forever. 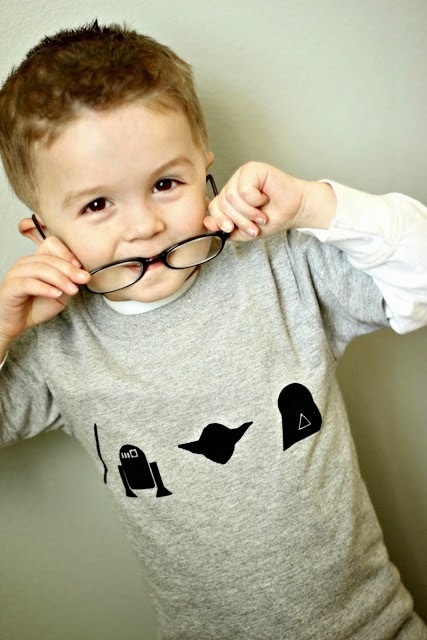 One of my very first projects to ever appear on this little old blog was a stenciled t-shirt made using freezer paper. Freezer paper is a little miracle. I am sure most of you have heard a little something about freezer paper. You can buy it in the foil and plastic wrap aisle at the grocery store. The roll is giant and is under $6. The stuff lasts forever. I use it predominately for stenciling on t-shirts, like the Ron Swanson T-shirt. 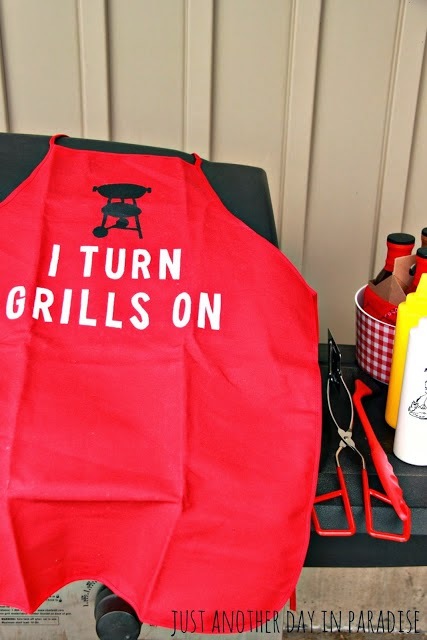 However, I also have used it for home decor, like in these Pillowcase Heart Envelope Throw Pillows and for making gifts like this Grill Themed Father's Day Present. 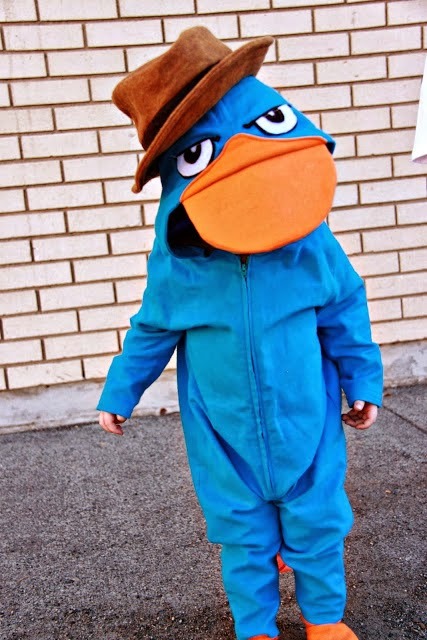 I also use freezer paper to draft my own patterns, like when I made this Perry the Platypus costume for Bean. These paper doilies are fantastic. You can find them in the cake decorating section and they come in all kinds of wonderful sizes. I use these for TONS of things. I have sewn them together to make a banner or two, like part of my Gingham and Burlap Christmas decorations. I have used the big ones in a dessert box. The smaller ones make great embellishments for packages. They are just so pretty and so super useful. I always have package on hand. Who doesn't love a great paper lunch bag. I love them for packaging. LOVE them. I love that I can get them in either white or brown. You can stuff them full. Cut them to make a smaller envelope. 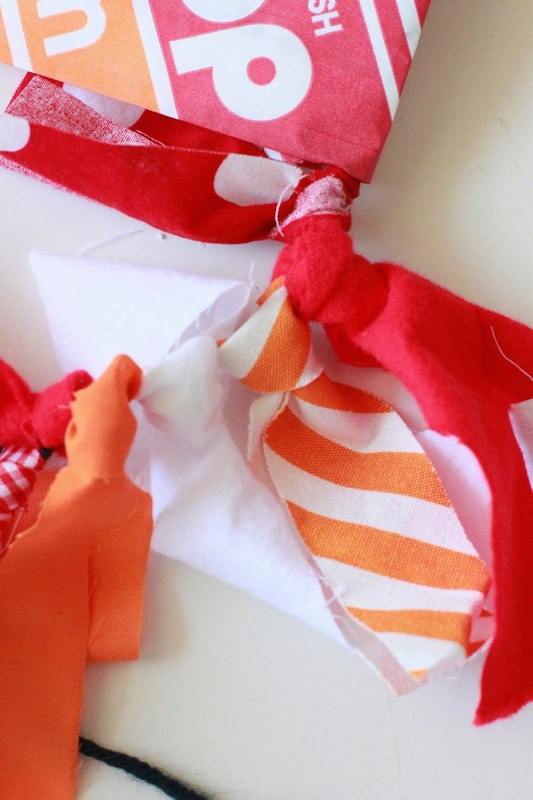 Sew on them, tape on them, or tie them up with a ribbon. Seriously it is probably one of the cheapest ways to package treats and goodies. 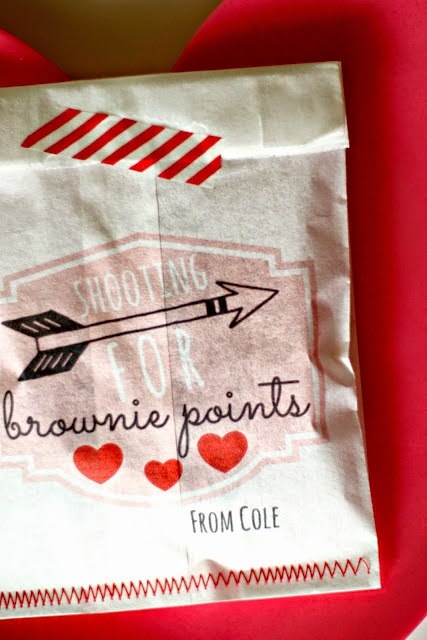 My love of paper lunch bags only increased when I figured out I could print on them from the computer, like in these Brownie Points Teacher Valentines. 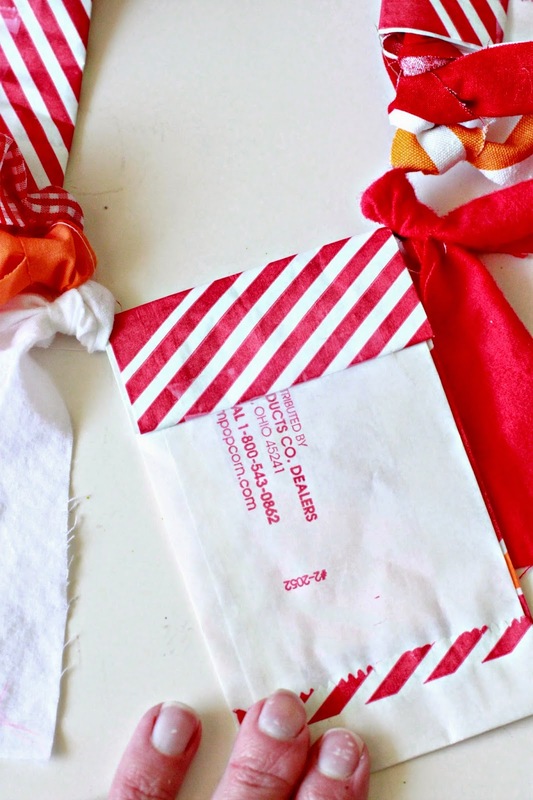 I show you how you can print on a lunch sack HERE. Okay, so technically these don't really cost anything. However, make sure you use good manners and don't take too many. There are projects all over Pinterest that use paint sample cards. I like using them mostly for party banners. I gather up several colors and then I just sew them together. I have punched out circles, cut them into strips, or just left them the way they are. 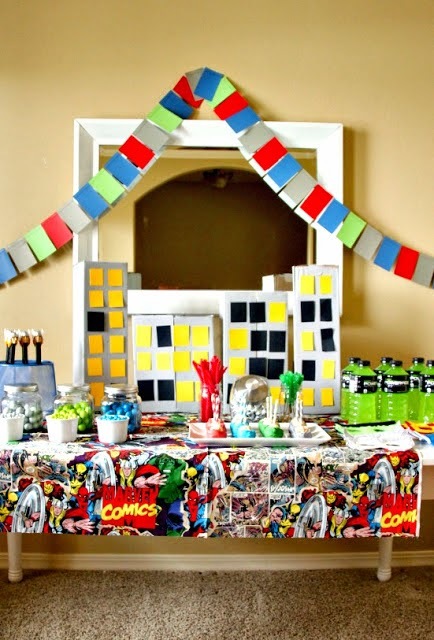 Either way, they are a quick and easy way to make a party decoration, like I did for this Avengers Birthday Party. No explanation needed. I pretty much will spray paint anything, but abandoned buildings and train cars of course! Walmart has a great supply of spray paint. For basic colors and spray paint Walmart is the cheapest. I have a hard time narrowing down my list of spray paint projects, because basically I have too many. 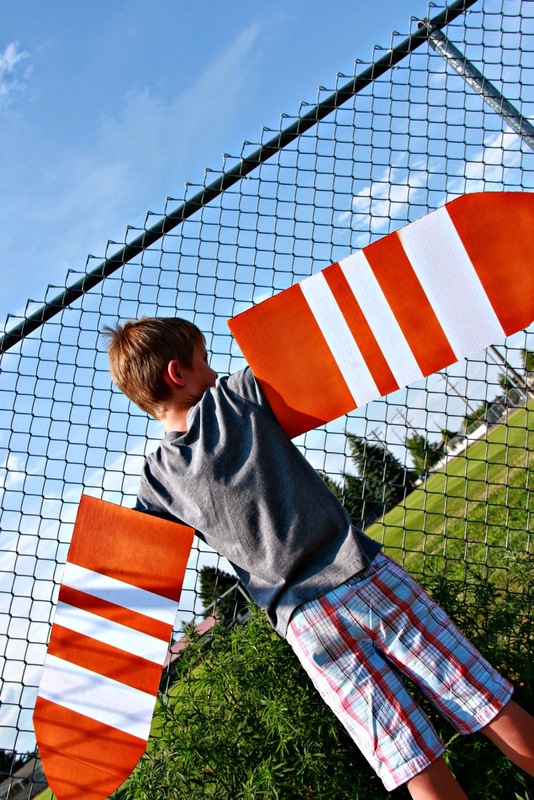 These Kid Airplane Wings were a fun project. I have made in no secret of how much I LOVE canning jars. First and foremost, oh you know I actually can food in them. You know like Pears, Strawberry Lemonade, Homemade Jam, Salsa, and the list goes on. I also like to use canning jars for oh-so-much more. I have spray painted them. I have stuck on vinyl. I use them for storage. I put treats in them. I bake pies in them. I use them for drinking glasses. Really this list could go on. 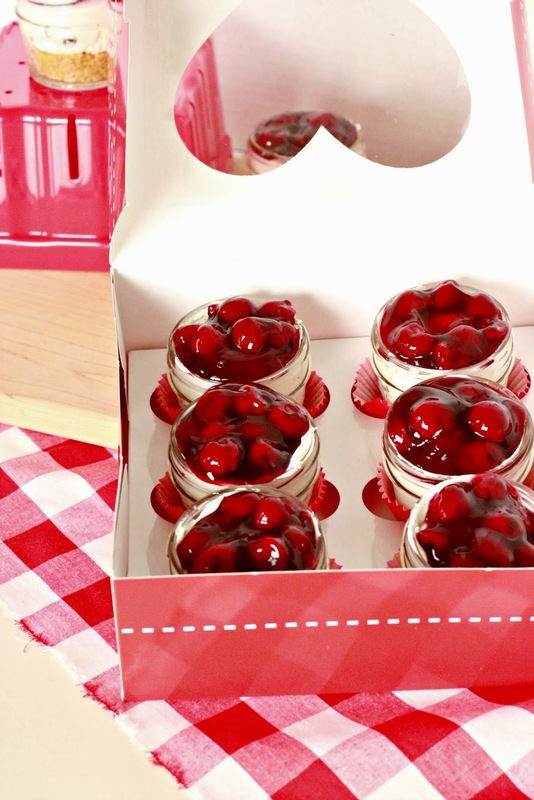 These Cherry Chocolate Chip No Bake Cheesecakes and most recently this Smart Cookie Teacher Appreciation gift are a few of my favorite jar projects. The neat thing about canning jars is that they come in so many sizes, shapes, and now even colors. The other day I actually found 1/2 gallon canning jars. Guys, I was so excited I clapped in the aisle. Yes, clapped. 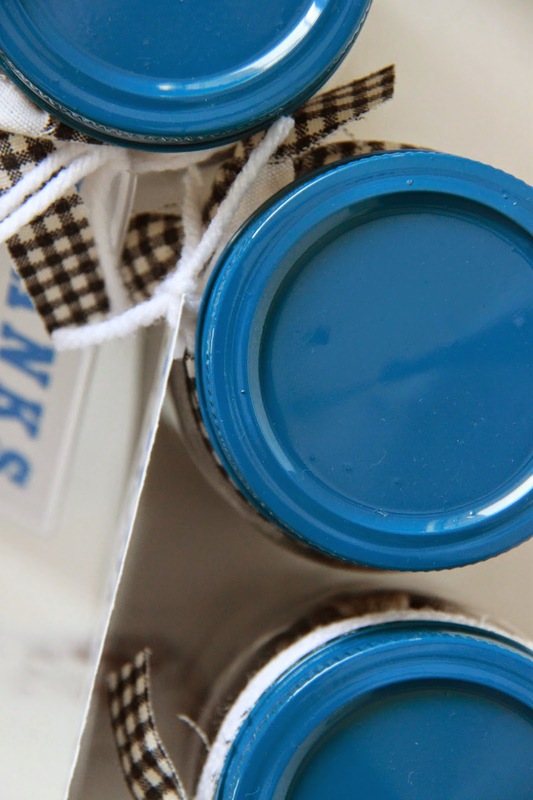 If you are in the market for some canning jars, and frankly how can you not, head on over and grab yourself a couple of cases. Okay, so while this is my number two, and I can not get through a grocery trip with out buying some kind of fabric I will concede that not all Walmart stores carry fabric. They used to, but now only select stores do. So this little tip may not be helpful to all of you. Man I tell you what, if you live by a store that still carries fabric, stock up. Fabric is not just for sewing. Say what?! Are you sure? Why yes, yes I am.You can throw it over a table. 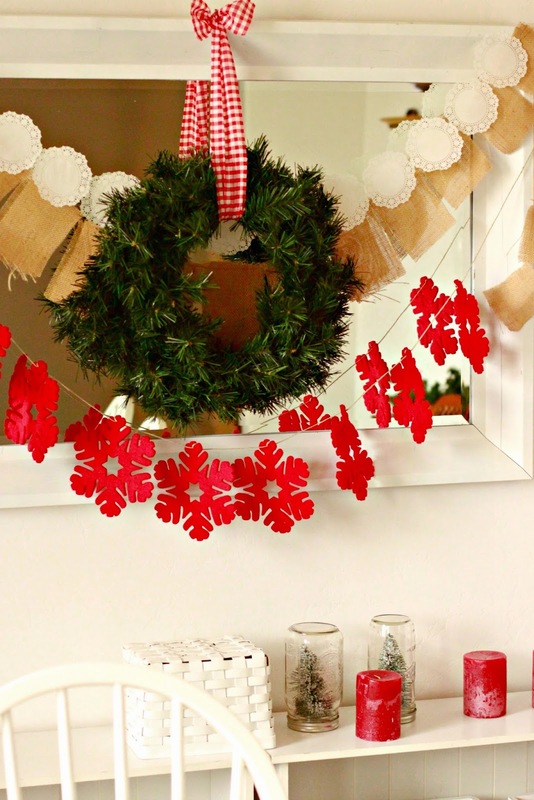 Cut it up and use it as ribbon on gifts. 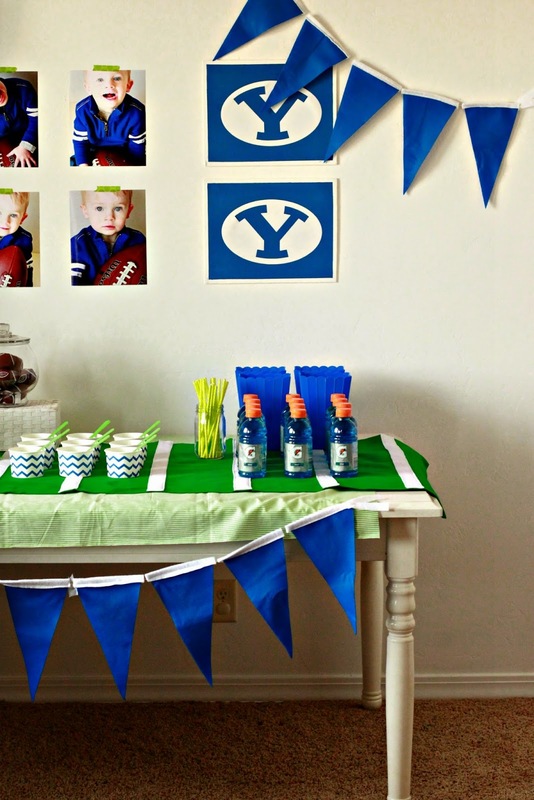 Tie it onto a string and make a banner. Stock up. Use at your leisure. 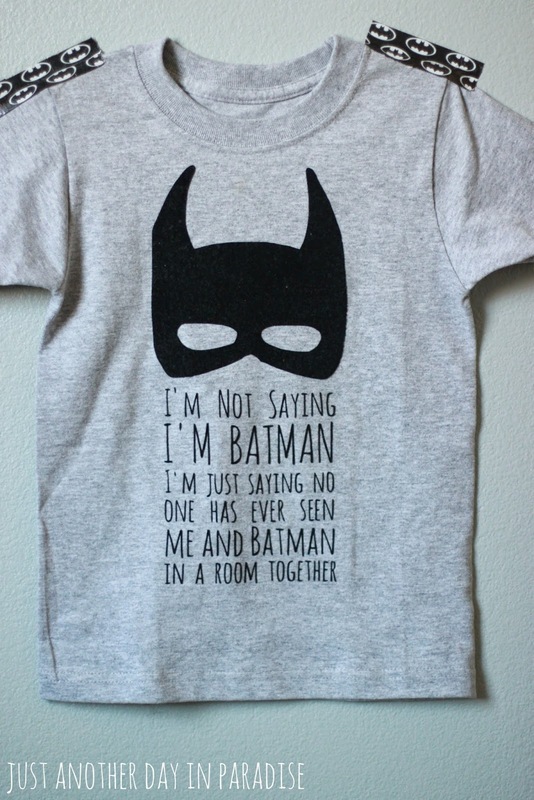 I make a lot of t-shirts for my boys, and by make I add on to already made shirts. At the price of t-shirts at Walmart it is way cheaper for me to buy a t-shirt and add on a cool graphic than it is to make it completely from scratch. Walmart carries tons of colors of kids t-shirts. They have crew neck, v neck, short sleeved, and long sleeved. I am obsessed with designing t-shirts and Walmart makes that easier on my budget. They are great quality because they are Hanes T-shirts. 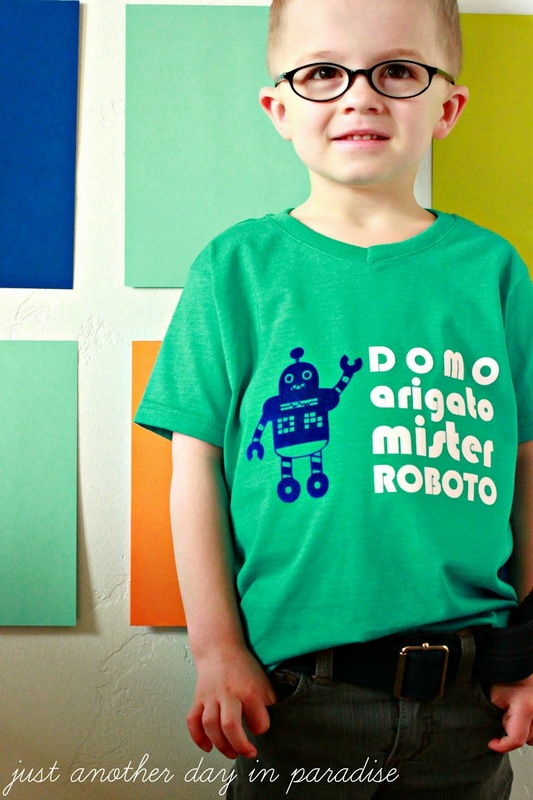 Whether you use vinyl or fabric paint, you can make a fun and unique t-shirt for your kiddos. Here are a few of my favorite shirts. Those are just a few of my favorites. I could do a hole post on my favorite t-shirt creations...but this is a post about other stuff so I will refrain. So there ya have it. My Ten Craft Supplies to Buy at Walmart. I hope you feel enlightened. Sorry if your "grocery" bill starts getting a little bigger. Sorry not sorry. Ha. Oh guys, we are pretty much in the season of lemons. Eek. I am so excited. I have shared my 2014 lemon excitement already when I shared a recipe for Lemon Cheesecake Pie a few weeks ago. Now with the sun shinning, the freshly mowed grass smell, later days, and school almost out for the Summer bring on the lemons. Bring it. Just after my love of all things lemon, is my love of all thing Strawberry Lemonade. 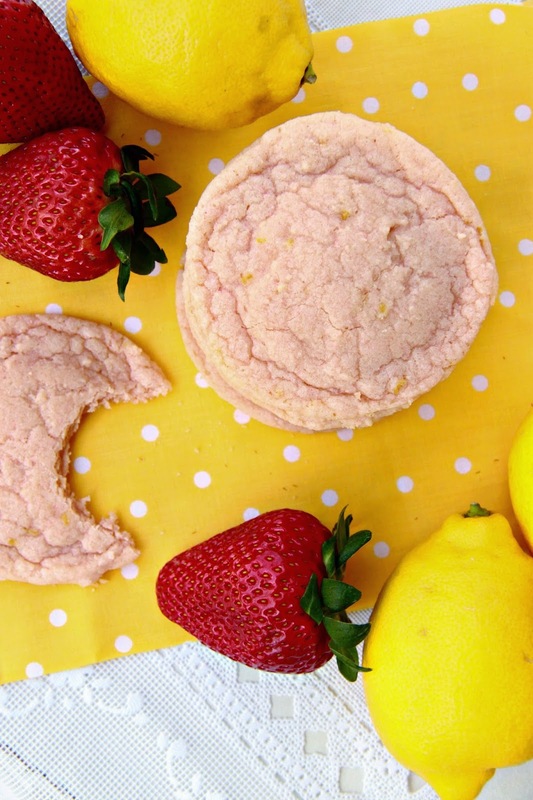 How can a person not love something that combines strawberries and lemons?! 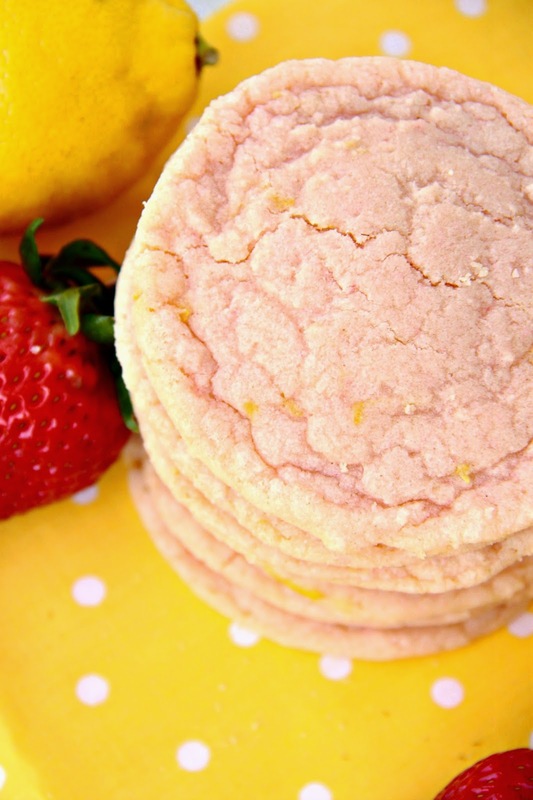 So I kind of had to make up a cookie recipe for Strawberry Lemonade Cookies. Then I kind of had to eat half a dozen cookies. These cookies make me happy. 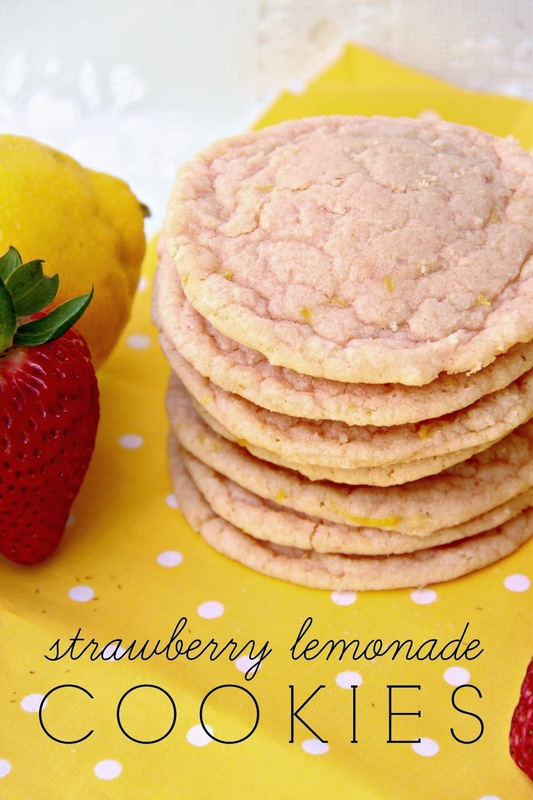 They are perfectly chewy with the right hints of strawberry and lemon. They are Summer in cookie form. In fact, when I baked these up the Little Men were playing outside in the sunshine. Birds were chirping. Lawn mowers were running. My yard was full of bicycles, balls, and shoes. There was laughter and shouting. When the boys were done playing, the cookies were waiting for them. 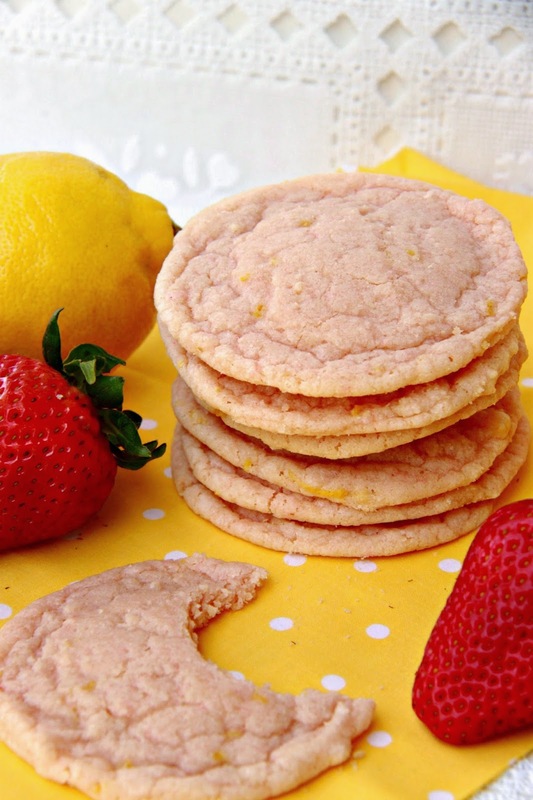 They happily devoured these Strawberry Lemonade Cookies. They were a hit. In the bowl of a mixer, cream together the butter and the sugar until fluffy. Add in the eggs and the vanilla. Then mix in the lemon juice. In another smaller bowl, whisk together the flour, salt, baking soda, and strawberry pudding mix. Add in the dry ingredients to the wet ingredients. Mix until well incorporated. Then add in the lemon zest. Using a cookie scoop, drop scoops about 2 inches apart. Bake for 10 minutes. Cool on a cookie rack. Now that the Momma's have been celebrated, the Dad's are up next for their time in the spotlight. 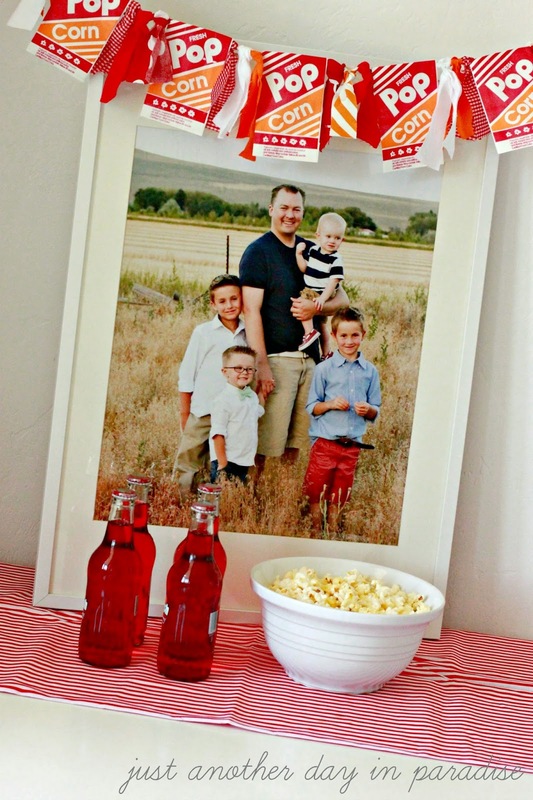 Here is a really easy and fast Father's Day decoration. Like ridiculously fast. Oh and hey, it is a no sew banner. Win. Win. 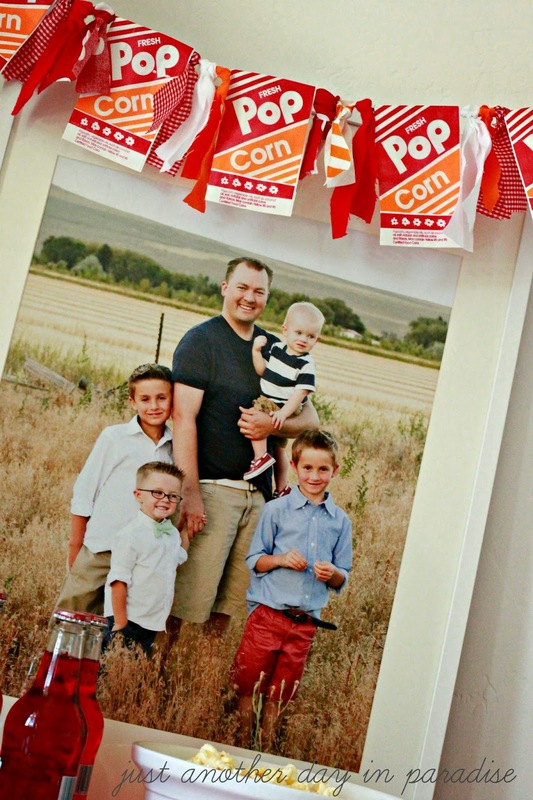 A few years ago I threw The Hubs a "Best Pop" popcorn Father's Day party. 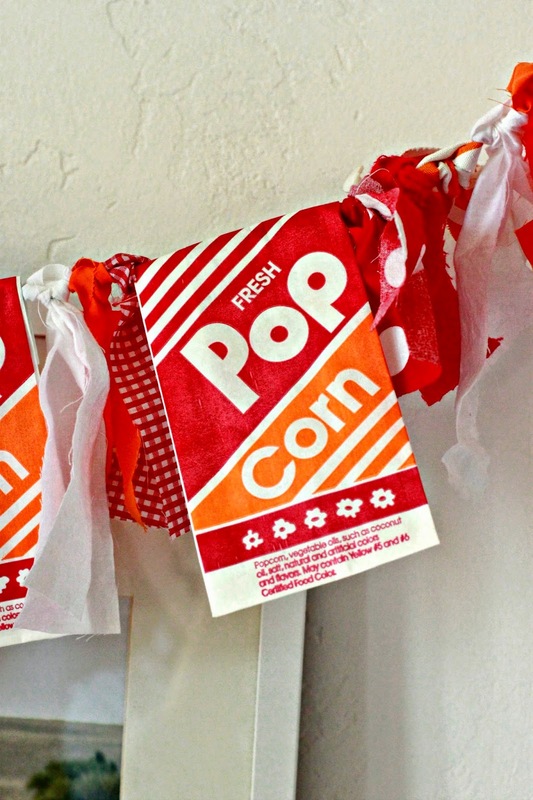 One of the things I made was this popcorn bag banner. I bought a pack of popcorn bags from my local party store and then I raided my fabric stash. 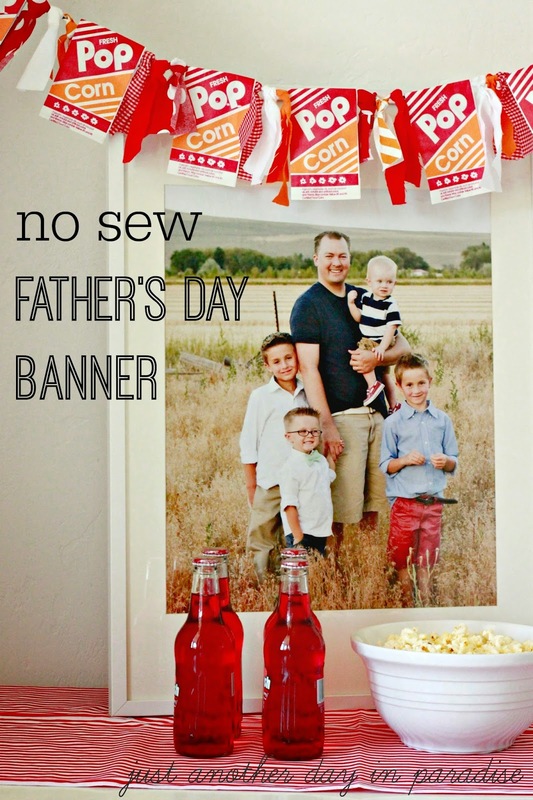 Put it all together and a no-sew banner is made. Start with a long piece of yarn. Cut up the fabric in strips. Tie the fabric on. I tied about 7 pieces on to start before I taped...yes I said taped...the first bag to the yarn. I just repeat the taping and tying until the banner is as long as I want it. 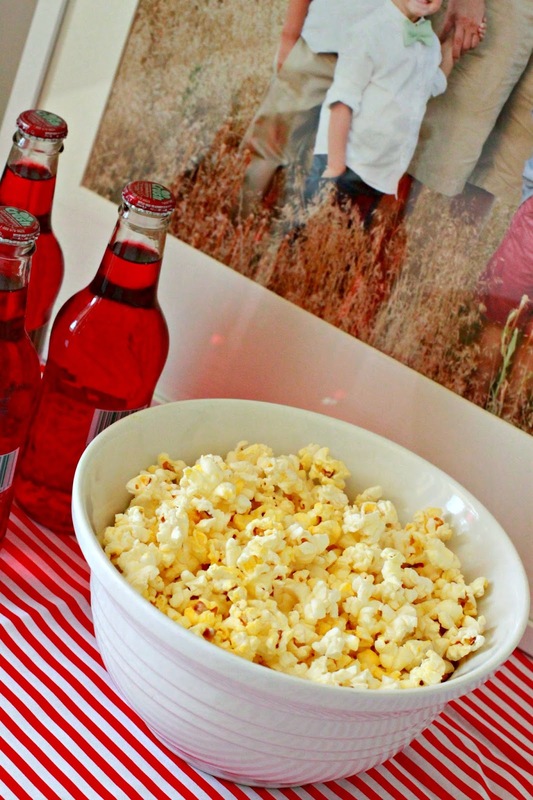 If you want to go with the whole "Best Pop" theme, then you can add some bottled pop and a few bowls of popcorn to the party. There ya have a fun and easy way to tell your dad he is the "Best Pop" you know. Way back in the beginning of my culinary exploits as a newly wedded wife I had a very teeny tiny arsenal of recipes I made. My pantry was pretty boring and basically stocked. I used a lot of canned this and packaged that. One of my solid gold go-to ingredients was the ever versatile , if not a wee bit boring, can of cream of chicken soup. I pretty much used it in everything. Like I said, not so much a cooking wizard. Now, I am not bagging on the can of cream of chicken soup. It has its place in the recipe world. I am just bagging on my own overuse of the can. So as years went by, I tried to kick the can. Not to be mistaken with the bucket or the curb. I pretty much succeeded. The only problem: sometimes a recipe you desperately want to make calls for a can of cream of chicken soup. Well, she is just gonna make some cream of chicken soup from scratch. No can necessary. 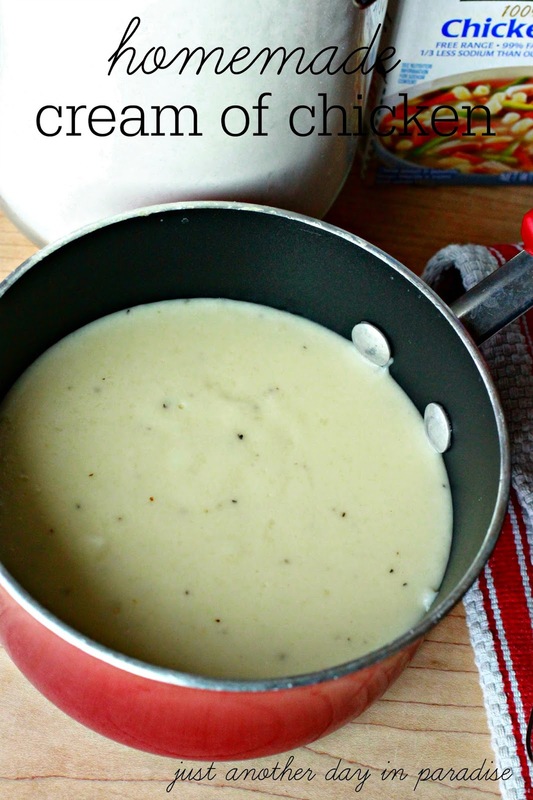 You know something, the from scratch cream of chicken soup was super easy to make. Plus, it was yummier and it is WAY healthier for you. I am pretty positive now I am going to make my cream of chicken soup from scratch from now on. 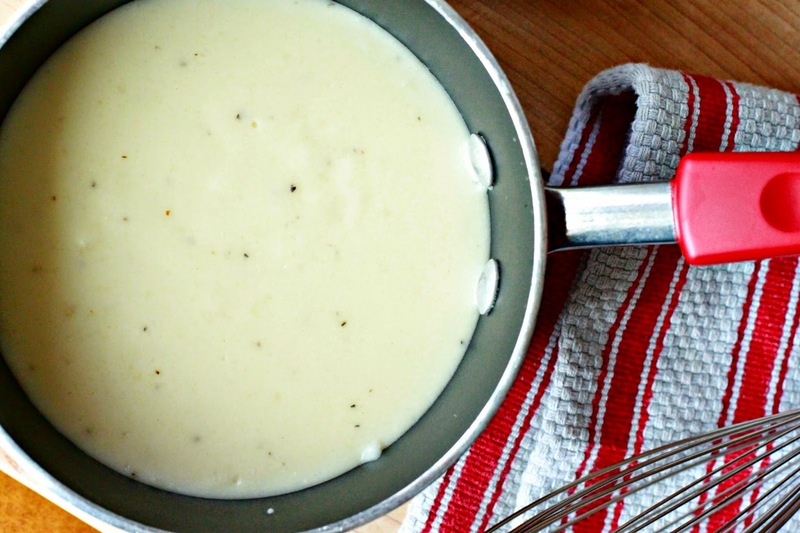 Then you can say you made your cream of chicken soup from scratch and I promise you will feel all June Cleaver-ish. Melt the butter in a small saucepan over medium high heat. When the butter is melted, whisk in the flour and continue to whisk until the flour is smooth and bubbly. Remove from the heat and slowly whisk in the chicken broth and the milk. Return to the heat and bring it to a gentle boil, whisking constantly until the soup thickens. Take off heat. Then add the salt and pepper. Soup will thicken as it sits. Use as called for. 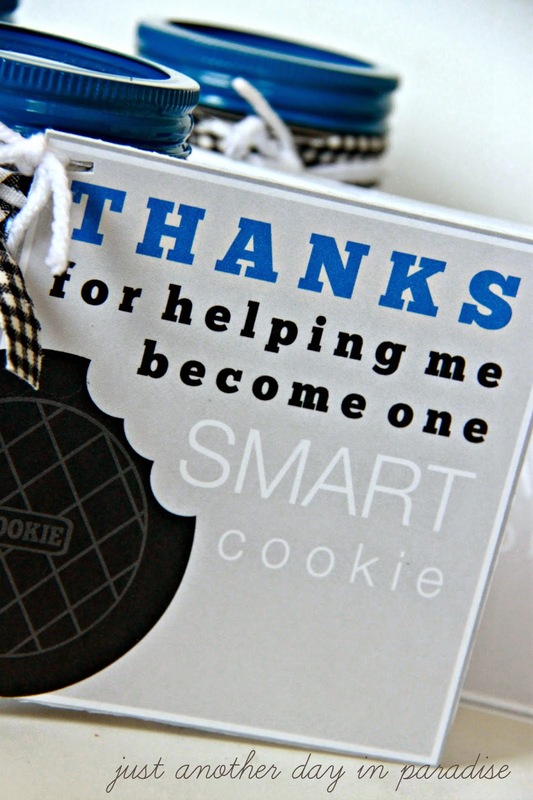 I have another Teacher Appreciation Gift idea for you today. It is easy. SO easy. Plus it is really affordable. I really wanted to have a non-sweet gift to give to our teachers. 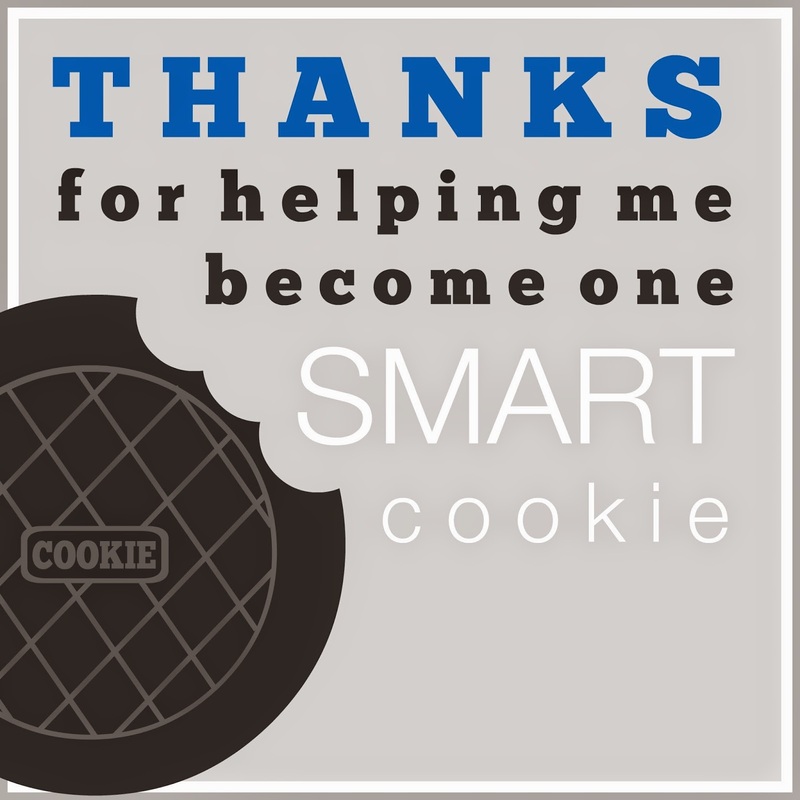 You know to accompany the totally sweet and sugary Smart Cookie Teacher Appreciation gift I also made for them. Ha. I love these water bottles. First, because they are kind of design-tastic. I know, who loves the design of water bottles. Well, this girl. The other reason I love them, is because even though they are disposable water bottles, they can actually be reused over and over thanks to the awesome spout. 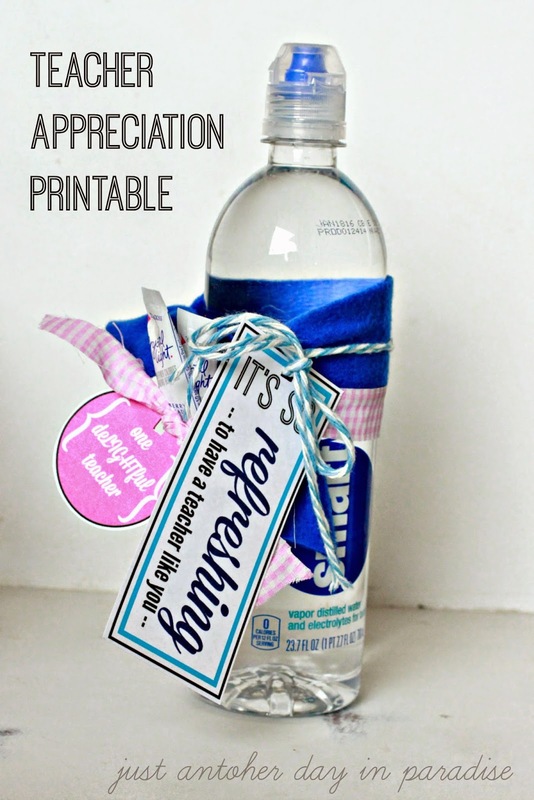 I used my love of these water bottles AND my love of Crystal Light as inspiration for this Teacher Appreciation Gift. 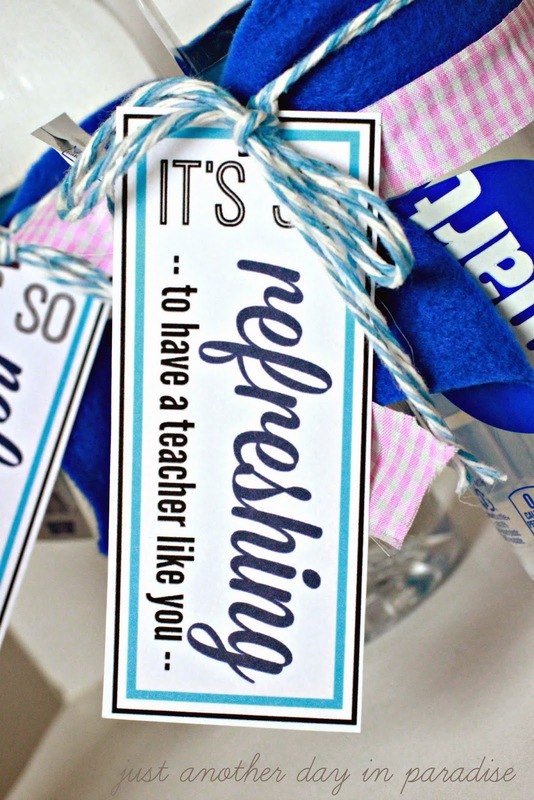 I made up these "refreshing" teacher tags to tie on to the water bottles. 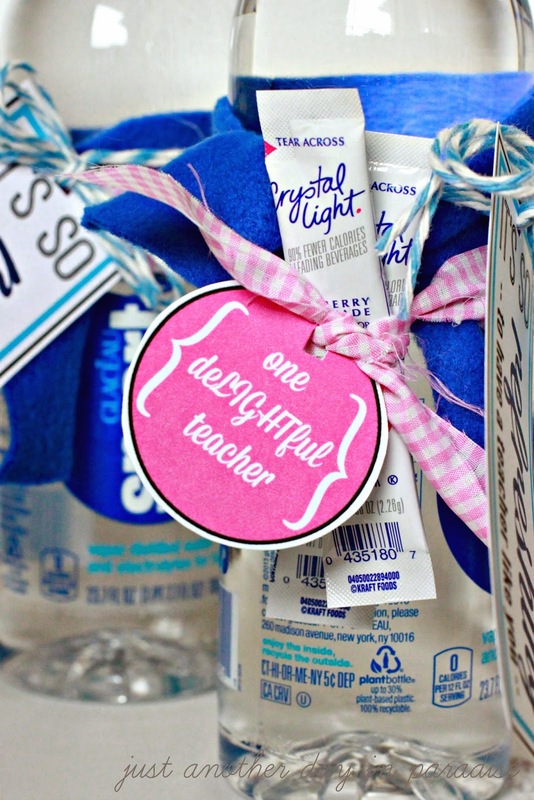 I also added these tiny circle "deLIGHTful" teacher tags to attach a couple of packets of single serving Crystal Light. I tied everything together with some fabric scraps and some yarn. Bam. 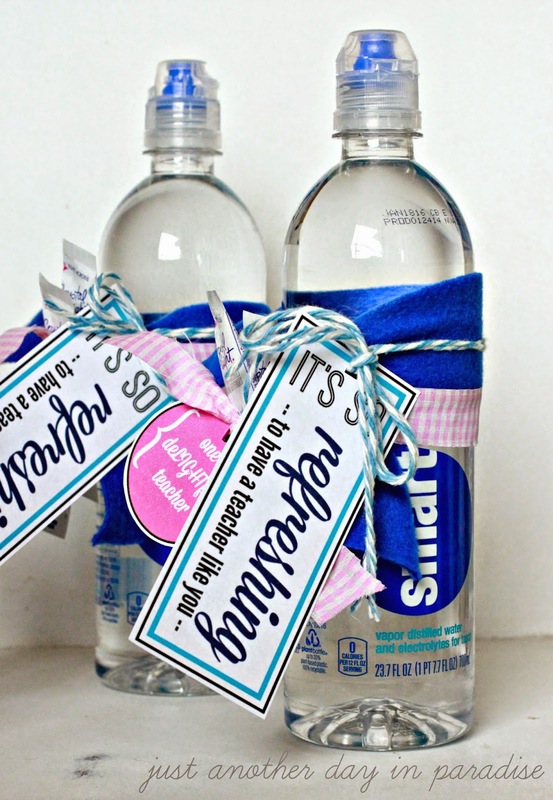 Just like that I have a cute and non sugary gift to give to our hard working teachers. 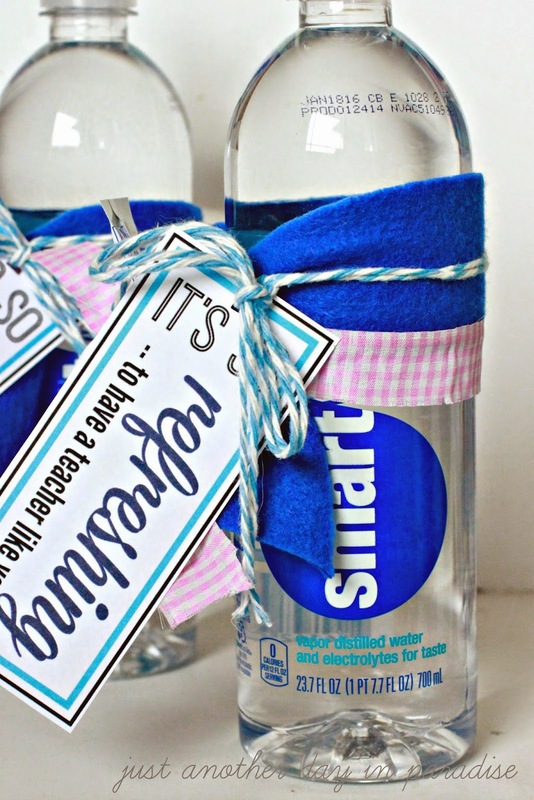 Download the Refreshing and DeLIGHTful tags HERE. Have you thanked a teacher yet? 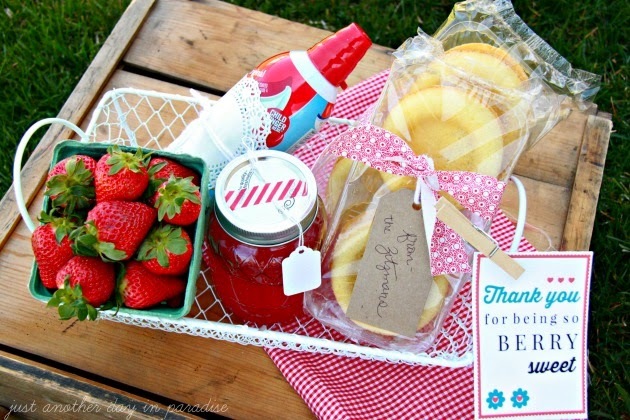 It is not too late to show your teachers some love and appreciation. 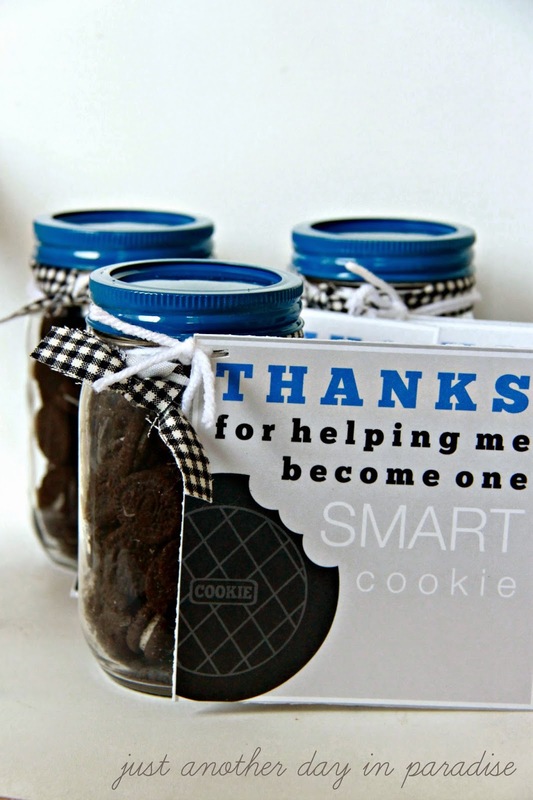 This idea and the Smart Cookie Teacher Thank You are both really easy to pull together last minute.